Ian McCulloch has recorded an album worth of orchestral versions of Echo And The Bunnymen songs as part of his new solo album. McCulloch's latest solo album will be a double album with one disc dedicated to orchestral versions of the Liverpool bands greatest hits. The idea for the album came about following a show McCulloch played at the Union Chapel in London in May 2012. Producer Youth has re-recorded the tracks, which will be released under the title 'Holy Ghosts'. Speaking about the Union Chapel show which inspired the plan to re-record his bands songs in a new fashion, McCulloch said: "It was like, something's happening here that you might want to document. The fact that it was so spontaneously decided we'd record it was lucky, because on the night I'd more or less forgotten. Usually you're too aware of everything being mic'd up and all that, but this time, after the first chord had been hit, I was in a world of me own." Other songs which have been reworked by McCulloch and Flood include The Bunnymen's 'Lips Like Sugar', 'Rescue', 'Nothing Lasts Forever', and 'The Killing Moon'. Holy Ghosts is released on April 22 via Edsel Records and will come with McCulloch's fourth solo studio album 'Pro Patria Mori'. Echo & The Bunnymen New Album & Tour Announcement very soon. We are very excited to announce that the brand new studio album produced by Youth (The Verve, Embrace etc) is nearing completion and that a title and artwork are decided plus a full European tour already booked. US dates to follow. Ian feels it's the bands best work for a very long time. 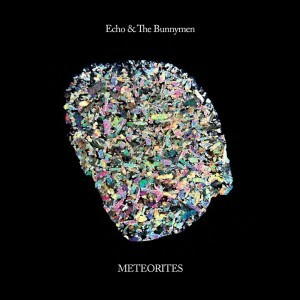 After dropping hints and teasing fans over the past few days, Echo & The Bunnymen today formally announced their 12th studio album Meteorites, which will be released April 28 in the U.K. and then on June 3 in the U.S. — and which will be accompanied by a just-announced spring European tour plus U.S. dates this summer. The 10-song album is produced by Killing Joke bassist Youth, and will be released by 429 Records in both the U.K. and U.S. All songs are written by frontman Ian McCulloch, and performed by McCulloch and band co-founder Will Sergeant, along with guitarist Gordy Goudie and bassist Stephen Brannan. The Bunnymen today also announced a 12-date tour this May that mostly will play the U.K. but also will include a trio of concerts in major cities in France, Belgium and the Netherlands. The run of dates opens May 2 in Leamington Spa, U.K., heads to Europe for those three mainland concerts, then returns to the U.K. for eight more shows, wrapping up May 20 in the Bunnymen’s hometown of Liverpool. According to the band’s announcement on Facebook, a fan presale will begin Wednesday ahead of the general on-sale. “We’re looking forward to playing a selection of the songs from the brand new studio record live for you, as well as some older favourites,” the band writes. According to the band’s publicity, the Bunnymen will tour the U.S. this summer. I'm going to Bristol, probably London also, depends how long they play for - it best be longer than the usual hour!! O2 let me buy "Priority" tickets for O2 venues so my Bristol and London tickets are sorted already. I doubt I will be online much tomorrow and Thursday so I will happily take any spares for London if I don't get one myself in time. They've been banging on for days about a "European Tour", I hardly call a load of UK dates and three dates on the European mainland a European tour! How many are you after, two? Just the one. I should really check when the football play-offs are this year, just in case! I can manage one easy enough, just hope they've improved since Christmas, they were poor and it was a Liverpool gig. The new album is being releaswd via Pledge Music, McCulloch's last project with Pledge Music was a total fiasco, CD was released approx three months late and there was non existent communication between Pledge Music and customers. Was going to pre order the new album, now though, I'm not so sure. To confirm recent press speculation, legendary post-punks Echo & The Bunnymen are indeed ready to release and tour the new studio album they’ve been working on - METEORITES will be out on April 28th, followed by dates in the UK and European cities throughout May. The scoop they’ve missed is that the band want to make a rare sortie into the brave new world of direct-to-the-fans online action. Technological sophistication of this altitude being something a bit different for McCulloch, Sergeant and co, just for METEORITES they’ll be offering you the chance to land some SPECIAL limited edition, collectable product and to get involved with the project through their website www.bunnymen.com. Standard issues on vinyl, CD and download will be available on 429 Records (worldwide) and distributed in Europe via Caroline/Universal from all worthwhile dealers. To hail the release of this new addition to the Bunnymen cannon, the band will hit the road again in May. They’ll be playing from the new LP, which should be well and truly inscribed in your frontal lobe by then, as well as some of their extensive back catalogue. It’ll be a salute to the past 35 years of music, so we hope you can join in. Thank you all for your continued support, and stay in touch online. We’ll be sharing more news and music from METEORITES over the coming weeks and months, so keep an eye and ear out. Until then dear friends.